Good, general purpose domed pellet. Suitable for springers and PCPs. More than expected weight variation. 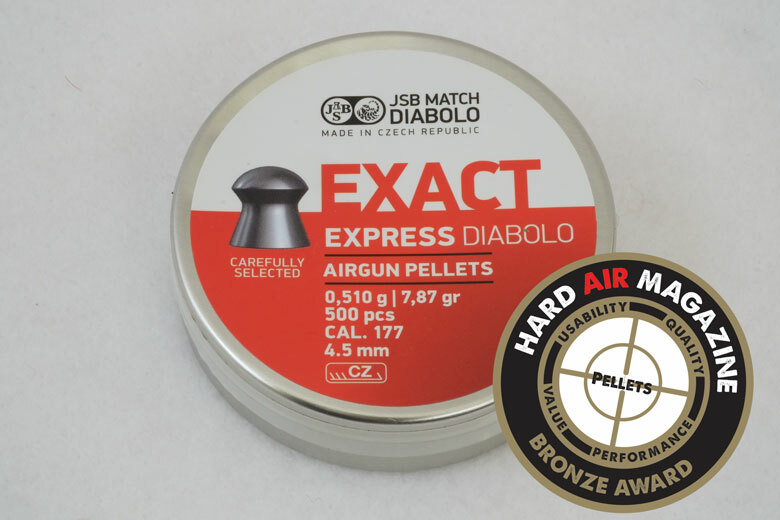 JSB Exact Express Diabolo 7.87 grain .177 pellets offer a good choice for shooting in many air rifles. The manufacturer has a great reputation for pellet consistency. However, the Exact Expresses tested by HAM had a rather large variation in weight. This, together with the somewhat extravagant claims made for muzzle velocity, knocked them out of a HAM Silver Award. 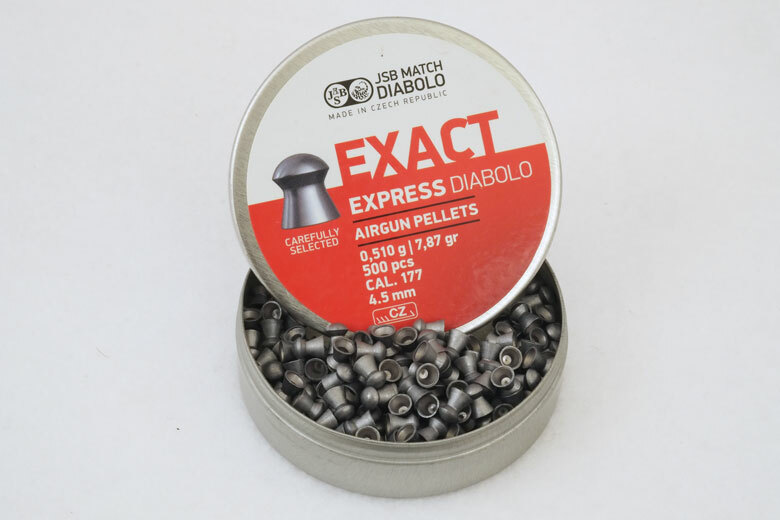 JSB Exact Express Diabolo 7.87 Grain .177 pellets are a lightweight dome head pellet from the Czech company. 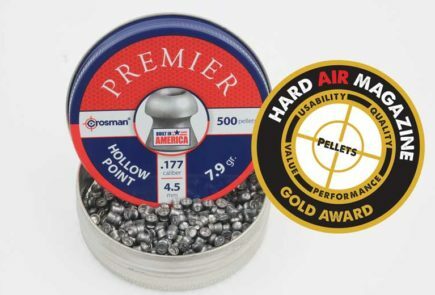 With a price per pellet of 3.4 cents, they are only slightly above the average price for .177 caliber lead pellets of 3.11 cents. This makes them excellent value, coming from a manufacturer with such a high reputation for quality. As leading online retailers offer “buy four tins, get one free” deals, the actual price to you can, of course, be much less. The manufacturer says that JSB Exact Express Diabolo 7.87 Grain .177 pellets are packed in tins of 500. We found a total of 502 pellets in the tin tested by HAM. The claimed weight is 7.87 Grains. The average weight for the pellets tested by HAM was 7.85 Grains. 12% of the tested pellets matched the claimed 7.87 Grain weight. The manufacturer says that “major speed is offered by these pellets” – at least in comparison with the regular 8.44 Grain JSB Exact pellets. However, when HAM tested both pellets in its Ballistic Coefficient testing, we found that the Express pellets shot at 960 FPS from our FX Impact test rifle. The regular 8.44 Grain pellets recorded 940 FPS. So, faster – yes. “major speed”, no. The Muzzle Velocity recorded by HAM was just 20 FPS faster than the regular – 8.44 Grain – pellets. The JSB Exact Express Diabolo 7.87 Grain .177 pellets tested by HAM displayed very consistent head diameters. 76% of the pellets had a head diameter of 4.50 mm. Just a few pellets had head diameters that were 0.01 mm larger than smaller. To put that into perspective. 0.01 mm is about one third of a thousandth of an inch. That’s the degree of accuracy to which these pellets are produced – and the HAM team is measuring! 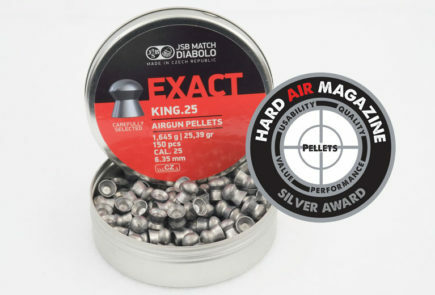 The difference in diameter between the largest and smallest diameter pellets was just 0.44%. As usual, the weight the JSB Exact Express Diabolo 7.87 Grain .177 pellets tested by HAM was rather less well controlled. This comment applies to all pellet manufacturers, not just JSB. 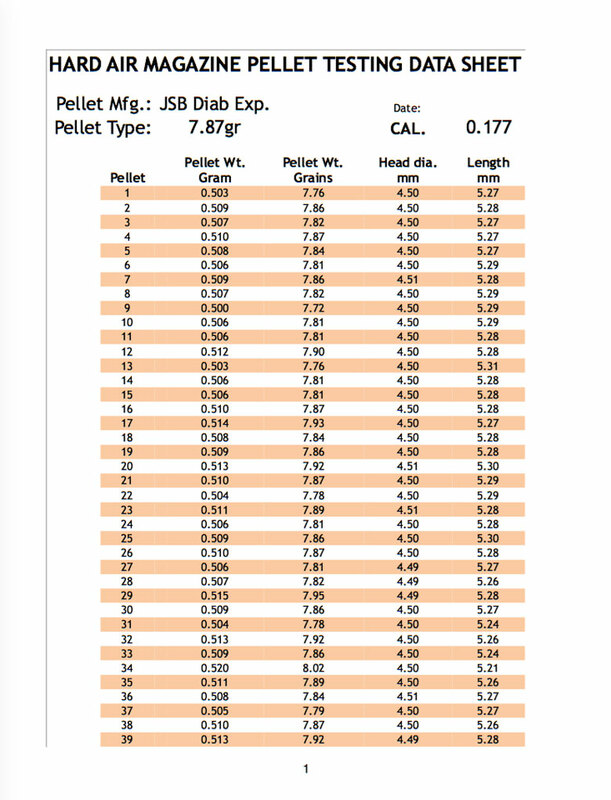 As you can see from the chart below, the weights of individual JSB Exact Express Diabolo 7.87 Grain .177 pellets tested by HAM varied from 7.72 Grains, right up to 8.02 Grains. That’s a difference of 3.89%. The average weight of the pellets tested by HAM was 7.85 Grains. The most common weight was 7.81 Grains – 16% of the pellets were of this weight. 12% of the pJSB Exact Express Diabolo 7.87 Grain .177 pellets tested by HAM matched the 7.87 Grain weight indicated on the tin. As you can see below, the lengths of the JSB Exact Express Diabolo 7.87 Grain .177 pellets tested varied between 5.21 mm and 5.31 mm. That a maximum variation of 1.9%. Although the average length was 5.27 mm, the most common length was 5.28 mm. There were no damaged or malformed pellets in the tin tested by HAM. As always, HAM tester Doug Wall weighed the amount of lead dust and small particles present in the tin using an incredibly-precise milligram balance. 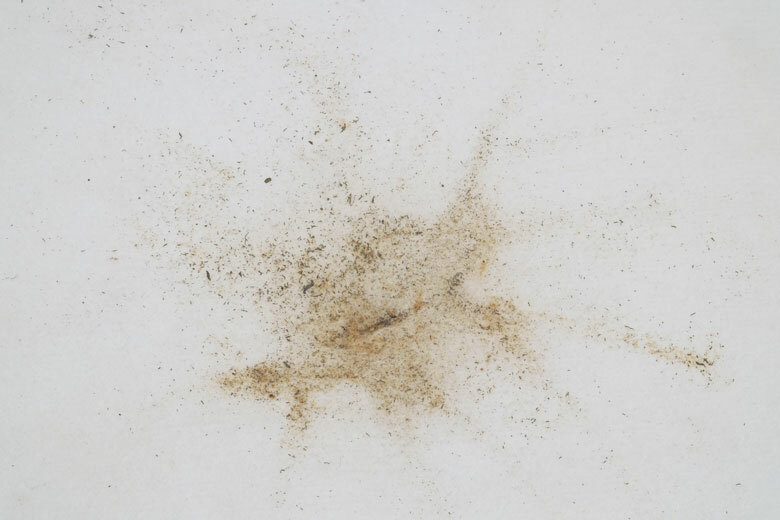 The dirt in the tin of JSB Exact Express Diabolo 7.87 Grain .177 pellets weighed 0.99 Grain. That’s an average of 0.198 Grains per 100 pellets. The photograph below shows the results. As can be seen, most of the “junk” is very small pieces of dust. 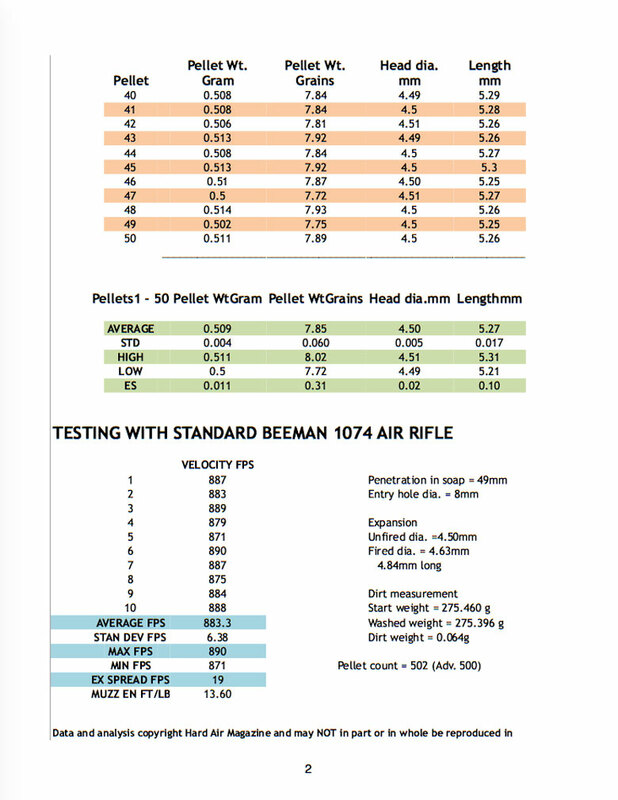 Using the Ballistic Coefficient of 0.019 from the HAM Ballistic Coefficient database, together with the Chairgun Pro software from Hawke, we generated the chart of downrange performance you can see below. The standard HAM Beeman 1074 air rifle fired the JSB Exact Express Diabolo 7.87 Grain .177 pellets with an average Muzzle Velocity of 883.3 FPS. The Standard Deviation ( the measurement of shot-to-shot variability in the string) was a creditable 6.38 FPS. This shows an effectively “flat” trajectory from about 12 Yards to 41 Yards. The light weight and relatively low Ballistic Coefficient of the JSB Exact Express Diabolo 7.87 Grain .177 pellets mean that they are not intended for serious use in airgun hunting. Although the Muzzle Energy produced by the JSB Exact Express Diabolo 7.87 Grain .177 pellets when fired from the Beeman 1074 air rifle was 13.60 Ft/Lbs, it dropped rapidly. Already by 27 Yards, it was down to 70% of the Muzzle Energy at just 9.5 Ft/Lbs. Penetration into HAM’s standard ballistic soap was 49 mm and the wound entry hole measured 8 mm in diameter. 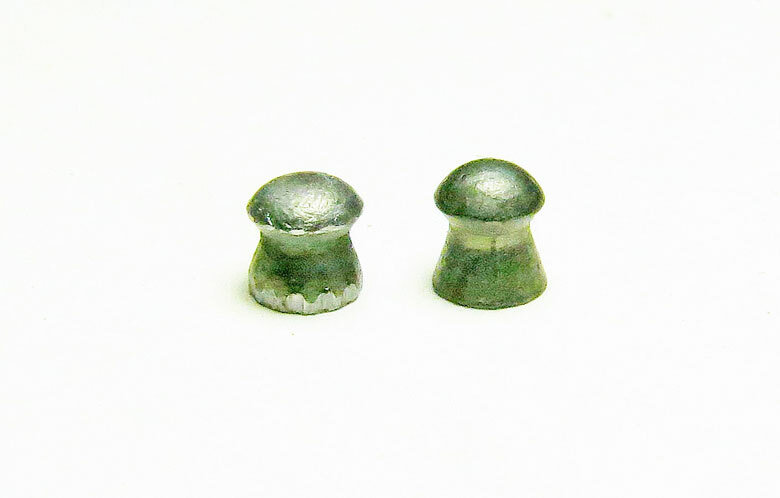 The photograph below shows the fired pellet, compared to a typical, unfired example. As you can see, the JSB Exact Express Diabolo 7.87 Grain .177 pellet expanded out to 4.63 mm diameter from the initial 4.50 mm figure. An expansion of about 3%. 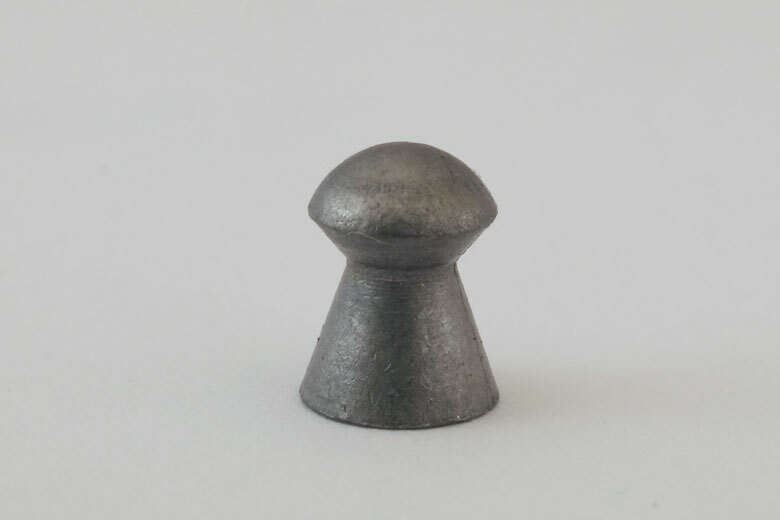 The effect of the rifling on the skirt of the fired pellet is quite pronounced. 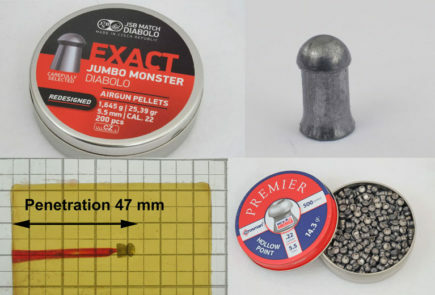 JSB Exact Express Diabolo 7.87 Grain .177 pellets are widely available online, although unlikely to be found at your local big box sporting goods store. The foam packaging inside the tin kept the pellets well packaged in transit. However, the HAM team continues to struggle with JSB’s standard push fit lids! We find these either too tight and difficult to remove – with a good chance of dropping everything onto the ground – or too loose, in which case they tend to open by themselves at inopportune times.